College graduates struggle to cope with the real world. Music offers refuge in this modern manga with an American attitude.Meiko Inoue is a recent college grad working as an office lady in a job she hates. Her boyfriend Shigeo is permanently crashing at her apartment because his job as a freelance illustrator doesn't pay enough for rent. And her parents in the country keep sending her boxes of veggies that just rot in her fridge. Straddling the line between her years as a student and the rest of her life, Meiko struggles with the feeling that she's just not cut out to be a part of the real world. http://benefitsofbeinganerd.booklikes.com Benefits of Being a Nerd 5.0 Solanin Review! Great, great, great. The draw­ing is beau­ti­ful and the story is strong. 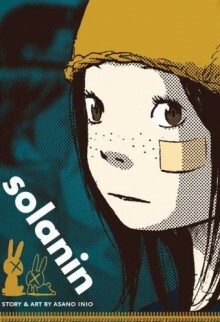 If you like manga, and don’t want to spend your time read­ing a 44+ vol­umes strong series, but want one solid story, then you should def­i­nitely give Solanin a try.